Tres Leches is a classic. But a classic from where, you may ask? Ask an Argentinean: From Argentina, of course. Ask a Cuban: Sin duda from Cuba. Ask an Ecuadorian: Claro que from Ecuador. A Venezuelan? Por supuesto que es de Venezuela. Ask a Mexican…Of course, sin duda, claro que por supuesto que es Mexicano. No doubt, it is Mexican. ¡Si señor! It would seem that each and every single Latin American country claims the Tres Leches Cake as its very own. Not only does everyone absolutely love it, it is also a dessert that is deeply ingrained in that nation’s gastronomy and culture. From here or from there, it is that much adored. 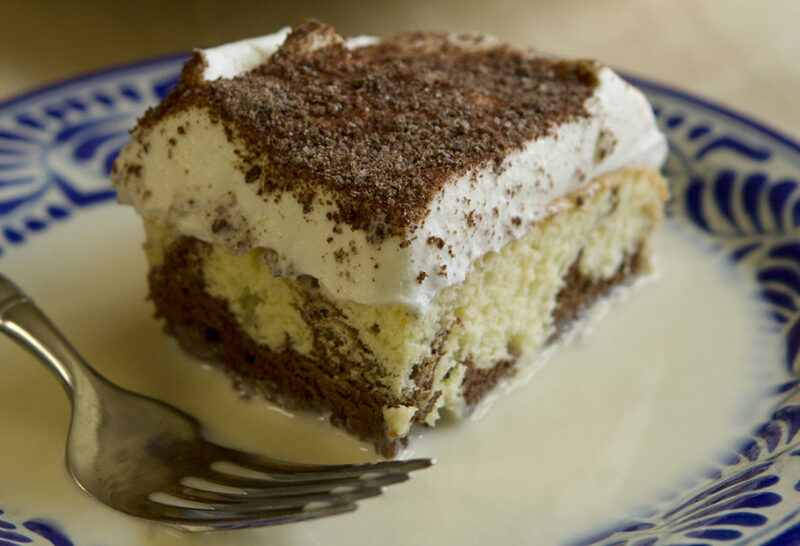 No matter where you are in Latin America, or which country you or your family came from, the traditional way to make a Tres Leches Cake is to make a sturdy sponge cake and then completely bathe it in a tres leches sauce. The three milks in the sauce are the fresh tasting regular milk, the lightly savory evaporated milk and the charmingly sweet sweetened condensed milk. As the decades have gone by, many other variations have appeared in attempts to dress up and reinvent this classic. With cajeta or dulce de leche, different kinds of nuts, coconut, spiked with rum, exotic fruits, coffee… to name some. Indeed, the cake lends itself to be played with: it is basic, it is easy, and it can be easily transformed. At home, we absolutely adore chocolate. And, since my boys have a hard time making up their minds as to when to make the Tres Leches Cake vanilla and when to make it chocolate, one day I decided to go marbled. That was it: we rarely go back. In my marbled version, the vanilla cake has fudgy chocolate swirls that go wild when soaked in the tres leches sauce. I garnish with copious amounts of grated Mexican chocolate all over the top and a sprinkle of ground canela. If you want to make it even more decadent, grab some cajeta or dulce de deche and drizzle liberally over the top. p.s. To boot, the Tres Leches Cake can be made ahead of time, it gets better and better as it soaks and chills bathed in the sauce. It is also perfect to bring along. Preheat the oven to 350 degrees fahrenheit with a rack in the middle. Butter a 9x13-inch baking pan and line the bottom with a piece of parchment paper. To make the cake: In a stand mixer fitted with the whisk attachment, beat the egg whites on medium-high speed until they hold soft peaks, about 4 to 5 minutes. Reduce the speed to medium and slowly add the sugar, beating until the whites hold stiff, shiny peaks. Transfer to a large bowl and set aside. Pour the egg yolks into another large bowl and beat with a whisk or fork, until fluffy and pale yellow. Add the vanilla and continue beating until fully incorporated. Gently fold the egg yolk mixture into the egg white mixture with a rubber spatula, taking care not to deflate the whites. Fold in the flour 1/4 cup at a time and mix well. The batter will look a bit streaky. In a small bowl, combine the hot water with the cocoa powder. Pour half the cake batter into another bowl and fold in the cocoa-water mixture with a rubber spatula until thoroughly mixed. Spread the vanilla batter in the prepared pan. Pour the chocolate batter on top, in a straight line down the center. With a knife or spoon, make a whirling design from one side of the pan to the other. Bake for 22 to 25 minutes, until the top of the cake has lightly browned and feels spongy to the touch. Remove from the oven and let cool. Invert the cake onto a large platter or board and remove the pan and parchment paper. Cover the cake with an upside-down platter large enough to hold the cake and the vanilla sauce and invert again so the cake is right side up. Using a fork, poke holes all over the top of the cake, so it will absorb the sauce. To make the sauce: In a large bowl, combine the three milks and vanilla and stir to blend well. Pour about 2/3 of the sauce over the cake. Don’t worry if it looks like there is too much sauce—the cake will absorb it. Cover and refrigerate for at least 2 hours or overnight. Reserve the remaining vanilla sauce. When you are ready to finish the cake, remove the cake from the refrigerator and spoon the remaining sauce on top of the cake. Make the whipped cream: In a stand mixer fitted with the whisk attachment, whip the cream and the confectioners’ sugar on medium speed until it holds well formed peaks, about 6 minutes. Spread the whipped cream over the top and sides of the cake. Garnish with the grated Mexican-style chocolate. Hi Pati, I love your show! 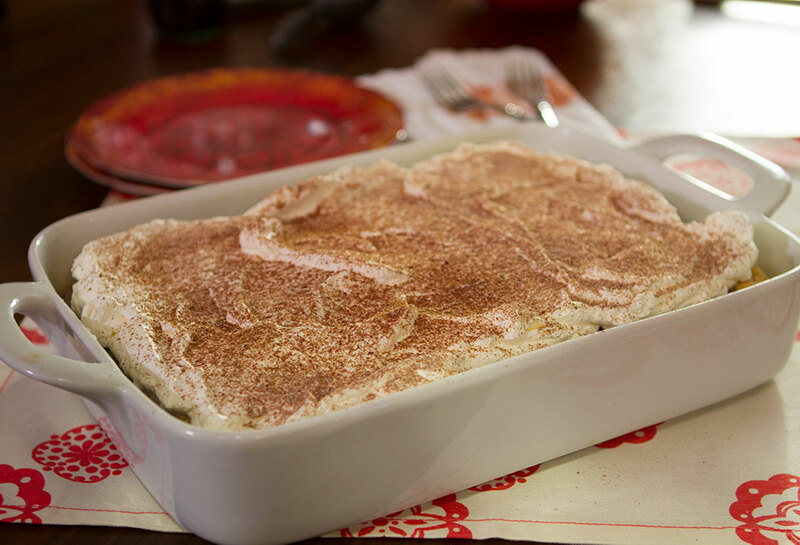 I can’t wait to make this cake, as well as the chipotle chicken pasta casserole from the Season 4 episode 7 where you cooked in the fan’s home. My question is, in the episode, it looks like the slice of cake is served on a plate/bowl that has some type of liquid in it- something thick. Can you tell me what it is? Thank you and keep on making our day and bringing us wonderful meals. It is such a joy to watch you and listen to your friendly voice. Blessings to you. Oh that is the liquid that the cake is soaked it. Enjoy the cake, Sarah! I really love your show and have made several recipes successfully. This cake was wonderful, not too sweet and the texture was firm and rose well. For me though, it was wetter than I liked. I would not pour over all of the last 1/3 of the sauce. There was quite a bit of liquid on the bottom of the cake. So yummy! Is there supposed to be baking powder in this recipe? The cake is not rising. Did you ever think of doing a traveling show? I like the places u visit in your shows but the segments are short. Yes, I know it’s a cooking show, but just a thought. Pati! Haven’t tried a recipe of yours that my family has not loved! Feels like you’re apart of our family! .. made this cake, is it supposed to be only an inch or so thick? We made this for my son’s birthday. DELISH!! The only thing is that the chocolate part was much denser than the vanilla. I am wondering if that’s normal or something went wrong…. For the Tres Leche recipe which I am going to try for our traditional Christmas Eve fiesta (sounds so decadent and delicious! ), you list the Dulce de Leche as a garnish but then don’t mention when this is applied but rather only the grated chocolate. Do you pour it over the whipped cream topping or individually over the cake slices when served? Thanks! Either way! Have a fabulous fiesta! I made this cake and it was sooooooo good! I mean, DANGEROUSLY GOOD!!!!!. Probably the best cake I’ve ever had. I was lost in sugary, milky bliss. Thank you for the amazing recipe Patti! Happy to hear you liked it, Heidi!! Thank you so much for trying it! Thanks for sharing this mouth watering post. I have read your blog and now I am a big fan of your recipes. Really you are giving the such a nice thoughts about the Mexican food. I am also a very foodie guy and I love to enjoy, taste and get the knowledge about new recipes. Hope you will be post the new dish with new creative ideas soon. Hola Sean!! Your comment made me so happy! Thank you so much for reading the blog and for trying my recipes! how do I make those wonderful Mexican football looking rolls? Can you describe a bit further? Hola Patti, I have some masa in the freezer and would like to make dumplings. Do you have a recipe that I could have? HOLA QUERIDA PATI , I LOVE THIS CAKE , BUT CAN I USE THE BOX MARBLE TAKE MIX ?? SORRY BUT ITS THE EZ E WAY FOR ME ?? I LOVE UR COOKING .I’M MEXICAN/AMERICAN MY ROOTS ARE FROM MONTERREY NUEVO LEON ..LOVE UR RECIPE GOD BLESS U AND UR FAMILIAR ,. Im having trouble making my egg whites merane i dont think i spelled it right. Anyway I leave egg at room temp. I made sure my mixing bowl and beaters are super clean. Give me some help. Also do u have a recipe snack to feed a crowd. Going to a potluck and there will over 50 people. I want to make it Spanish Themed food. Thank-u hope to hear from u soon. Thanks so much. I appreciate that you offered to recipes. I really enjoy your show. Thank you so much for such a quick response? Good morning. I have watched your show on many Sundays at work. You have such a wonderful personality and I enjoy watching the interaction you have with your sons when they help you in the kitchen or when they are enjoying the meals you have prepared. I would like to speak with you about a business opportunity for a book series. How can I contact you? Can you please let me know. I am in Los Angeles, California. My name is Irma Rodriguez – my email is listed above. I have heard of Mole, and that recipes are quite varried. I enjoy trying new recipes and wondered if you make this for your family much, and if you have a family friendly recipe you’d recommend? LOVE, LOVE, LOVE your show! I would love to take one of your cooking classes. I live in the Chicago area, any chance you will in my area doing a show or teaching a class? Hola Doris, Thank you so much for watching my show. I’m hoping to have a stop in Chicago on my next book tour…April-May 2016 timeframe. I will post dates on my schedule & events page (http://patijinich.com/schedule-events/) as I have them, so please check back! Hello Pati – ENJOY your show so much !! I have a question about salting pasta water. So many cooks say to always salt the water because it’s the only chance to flavor the pasta. I was wondering what your thoughts are to flavoring the pasta with other spices such as dried oregano, onion powder, garlic powder, etc. I know these spices are more expensive compared to salt, but I enjoy the taste they provide the pasta. Have a wonderful day !!! Hola Michele, So happy to hear you enjoy my show, thank you for watching! I think just a pinch of salt is all you need for flavoring pasta water, as many of the other flavors, such as oregano, garlic, etc., will come from the sauces or other ingredients tossed with the pasta. I have enjoyed you and your show and have made many of your recipes for my family and friends. I have searched high and low for orange blossom water but can not find it. Please help me! Can you give me a recipe to make my own? Thank you. Hola Kimberly, Sorry to hear you are having trouble finding orange blossom water! It can be tricky to locate, but I’ve seen many options for ordering it online. Also, you are welcome to substitute just plain water for any of my recipes. Good morning! I found it on your face book page….I just kept scrolling till I found it. But thanks for getting back to me. Oh and I don’t know if its suppose to do this or not but I got over 20 reply’s in my email…mine and a lot of other peoples questions. I love love love your show! Hola Pati, I would love to find a recipe for cooked beef that you can use for burritos, tacos, etc. In restaurants, they cut up the beef in small pieces and just add whatever ingredient to make a delicious burrito. Any tips on the type of meat used and a recipe? the same recipe is on every recipe site in the country. If there are variations, they are mainly in garnishes. Great flan! And if you have one of those BIG round tins of Guava Paste, it’ll make at least 2 Flan. Rick Bayless has a recipe for dessert tamales made wth Guava Paste and Cream Cheese. Hi I have a question that nobody seems to be able to answer. A lot of receipts ask for”Heavy cream” I can’t not find it anywhere the only thing that they sell is heavy whipped cream. Can I use it instead of Heavy Cream. Yes you can! Sometimes it is called heavy cream and sometimes heavy whipping cream. I watch your program in Los Angeles PBS and love it. On program #408 was great alos. Need t oknow music names or scores you used in that episode if possible. Hi there! You know, we use so many for all of the episodes. The one that stays the same is the theme song called Dame, by a group called Domingo Siete. If I halved the recipe what size baking pan should I use? I think you should cook it the way you like it and then try experimenting with new ways and new tastes: so many options! I was watching your show yesterday and you made carnitas ” with your family’s secret ingredients” not sure if the show was a re-run or new. It had condensed milk and orange in it. Is it possible to get that recipe? I went on your page but could not find it. Hi! I keep looking for your new season to return on PBS and it’s not there yet. Is it on another network now? Where are you? I miss seeing you. I was taping all of your shows. Thanks! Thanks Ramona! Have you reached out to your public tv or PBS station? They should let you know! The season is also on Create TV! Pati, I love your show, your accent, and your recipes. My question has to do with chilaquiles. I live in Texas, south Texas, to be exact, and some people make their chilaquiles so differently from the authentic plate I had in Mexico City during my travels. I remember tasting the corn tortilla bathed perfectly in a red sauce that was actually dry than wet. The cheese had a fresh homemade flavo, and the plate was served with the best refried black beans, scrambled eggs, and sliced avacados. I added the salsa on top, and my mouth exploded with delight! The recipient I have come across, even tasted lack so much flavor; all you can taste is powdered chili, garlic, tomato sauce and the preservates in the corn tortillas. Could you please give another show on preparing authentic chilaquiles from Mexico? people don’t know what they’re missing! I hope restaurant chefs watch too so they can stop reinventing one of the tastiest “antojitos” of mine. I don’t like “make-believe” or second-rate food. I pride myself in making excellent Mexican dishes like my grandmother used to cook. Thank you so much Becky. I think this is a great idea and will talk to my Director about including it on the next Season. I am looking for an easy recipe for “Chiles Enogada” do you happen to have one? This is about the Spaghetti with guajillo chiles. I’ve had a problem with the chiles remaining brittle and dry when attempting to saute in oil. Should they be reconstituted in hot water before adding to the noodles? Hi! They are really supposed to stay a bit chewy, so you can try cooking them a bit longer, or cut them finer. Also before adding the pasta, you can add some of the pasta water and let it cook with the sauteed chiles for a minute or so, to soften them up more. I loved your show on our public tv, but now you no longer are on there. We you ever go back to PBS or is there another channel I can watch you on in the USA. I currently live in Tennessee. Hi! Have you tried reaching out to your public TV or PBS station? Maybe they already aired it, but they can also do a repeat! Show is also on Create TV. Dear Pati, I love your show! I need a recipe for polvorones de canela. I know they are made with lard, rolled in sugar and canela. My madrina Ophelia Martinez made these, she passed away and I don’t have the recipe. Can you help? Unless you are talking about the flattened Canelitas? Chef seria posible que hubiera las recetas también en español? Voy a tratar de subirlas en español también pronto! Hi Pati, This year I decided to grow some poblano peppers. I ended up with a good crop, and I was going to dry some for storage but I thought maybe if smoking them would work better. And if so what kind of wood? I am going to make your chili rellenos though! They way I like to store them is already roasted or charred, sweated and peeled. A million ways to use them! Thanks, Jeannine! Won’t you give Chicken Tinga (you can adjust the chipotle sauce to just a taste) or the Corn Torte a try? Hi, I just bought a rather lage can of guava paste in the Mexican meat market. what do I do with it? Cakes, Pies, cookies I have no idea. I looked all over your site and I didn’t see any recipes. Help. Such a fan of your cookbook! Do you have any suggestions for a main dish for a dinner party for 14?? I’ve done carnitas y pork before, but any ideas for something else would be much appreciated. When will you be publishing your next cookbook. I have made so many of the recipes in your amazing cookbook now and would love to be able to look forward to a new cookbook with even more delicious recipes. Please tell me it will be soon. It will be super soon, Karen, thank you! Pre-Order likely to be up in Amazon in October and publication date is April 12, 2016. I am really happy with the way the book turned out! It will be called Mexican Today. My mama used to make Gorditas when I was growing up in Texas. Do you have a recipe for them? Yes, Patti! Will try to add soon!